Affinity Photo is based around four ‘personae’, or work modules: Photo, Liquify, Develop, and Export. Photo is a pixel editor, along the lines of Photoshop that affords an impressive number of layer-based editing options. The Liquify persona is an advanced warping option that can distort, pinch, compress, and move pixels at a stroke. Develop is where your Raw images will first be processed. And Export does the obvious and acts as a export hub for your photos. My first observation was that, unlike Lightroom, Affinity Photo doesn’t offer any cataloguing support and neither does it provide for the import of multiple images. While I can cope without a cataloguing facility–my images are carefully logged and stored anyway–not being able to upload an entire shoot or holiday of photos for processing does make it time-consuming operation to select, upload, and process a series of photos. Uploading a Raw image means that you’ll be taken to the Develop persona first. At this point, I found myself having to make a choice; did I want to remain in the Develop persona, which offers a split or mirror screen view that enables you to compare your edits against the original, or to head straight to the Photo persona where this dual view is only possible when making certain adjustments? The Develop persona offers most of the tools that I need for the majority of my edits, but the Photo persona can be slightly more user-friendly for others. Alternatively, I could bounce between the two, but that felt unsatisfactory, too. This semi-duplication of tasks feels like an oversight, especially when neither persona is comprehensive in its offerings. As an exercise in comparison, I evaluated the merits of both personae by editing a single image from start to finish in either Develop or Photo. Instinct told me that making people jump from one persona to the other isn’t efficient, but neither does remaining in a single persona to complete an edit feel in the best interests of the image. A comparison would help here. I started in the Develop persona; that is, after all, where your Raw photo lands when it’s imported into Affinity. The crop tool doesn’t provide you with the same number of aspect ratio profiles as you might get on Lightroom, but it’s self explanatory, and the straighten tool is perfectly simple. In Develop, you can adjust your white balance using a dropper, from the White Balance icon on the left of the screen, or you can play with the sliders. Unlike in Lightroom, there are no presets and if you press the ‘reset’ button for the sliders on the right hand panel, that takes both Kelvin and tint back to their starting points. Keep a pencil and paper handy if you like to change your mind. Perhaps my biggest concern with the Develop persona is the crude nature of the sliders. Budging the contrast slider to the right by only three percentage points has a dramatic impact on the tones in the image. I would appreciate a little more subtlety and refinement here. If you want to adjust the hue, saturation, or luminance of a specific colour, you’ll need to head into the Photo persona; there’s no option for that in Develop. So last up is a little sharpening and de-noising if required. At ISO 100, the landscape wasn’t noisy at all, but I gave it a quick sharpen. Then you need to hit the Develop button before exporting it. Here it is. In the Photo persona, cropping and straightening is no different. When you want to adjust your white balance, you can select an auto option. In this instance, I thought it far too yellow, so I had a go with the white balance adjustment layer. Here, you get a pop-up box, but rather than showing you a Kelvin scale and a tint slider, you see white balance and tint sliders both gauged in percentage points. Without a side-by-side comparison, it might feel a little tricky to adjust your white balance, but trust your eye. I made use if the hue, saturation, and luminosity sliders to increase the intensity of the greens, blues, and cyans in this scene, but not too much. And then it was to the Filters tab to select the Unsharp Mask and bring a little more definition to the scene. After that, it was just an export away. What do you think? While it might seem a little odd to perform a compare-and-contrast across the Develop and Photo personae, I wanted to show the differences between them in performance and to raise the issue of duplication. If using the Photo persona proves to be easier than the Develop persona, surely a simple Raw conversion task makes more sense? But if you want to give people the option to develop their Raw files comprehensively without shifting to the Photo persona, then the Develop option needs more refinement and attention. In particular, when there are two different means to perform one task–for example white balancing–but neither is optimal, it comes across as a waste of effort, and maybe even some mis-communication, from the developers. Neither persona feels complete right now, and that’s a shame. 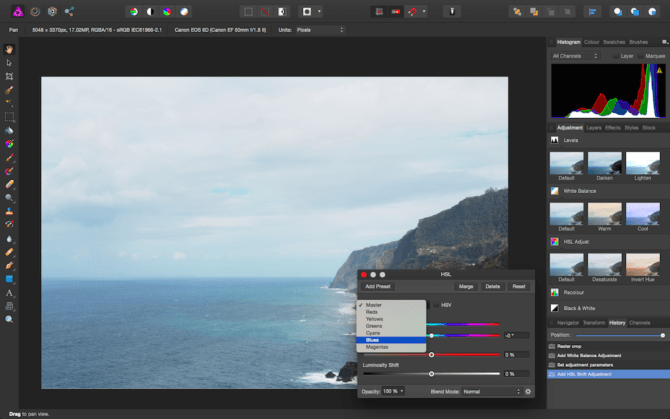 When I was editing other images, using a mixture of both the Develop and Photo personae, my overwhelming impression was that Affinity Photo requires refinement. So often it felt crude or clunky. The contrast slider is a perfect example. Here you can see the difference of just 10 percentage points. The black and white conversion option did the job, but again, it didn’t feel as smooth or as nuanced as it could be. At ISO 1000, there was just a hint of grain that I wanted to smooth out of this shot, and the de-noising mechanism felt that bit too slow, too. When it came to making selective adjustments, I was pleasantly surprised. The area around Finnbar’s eyes was just a little too dark for my liking, but I was easily able to select it using the selection brush tool in the Photo persona and increase the exposure a touch. Similarly, the healing brush worked well to remove some blemishes from my subject’s cheeks in this photo. Adding a vignette in the Develop persona is not the easiest process; it’s much easier in Photo, and matches the process you’d use in Lightroom more closely. Indeed, the terminology used to describe the actions when applying a vignette in the Photo persona is far more intuitive than Adobe’s language. Finally, I was quite disturbed to see that when I moved a photo from the Develop persona to the Photo persona, it could display as pixellated. Sure, it doesn’t export like that, but when you’re trying to make detailed edits, that’s not ideal. Take a look at the branch on the shoreline towards the right of the frame. It’s not smooth. 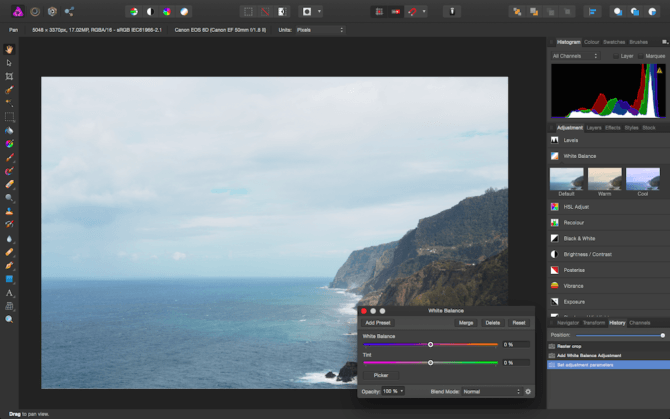 With a £40, subscription-free, fee, Affinity Photo is very wallet-friendly, but it’s not for me. For someone who wants something that is more Photoshop-esque, but at a fraction of the price, it could well be the right choice. I’ve been spoiled by years of using Lightroom and maybe I’m going to have to make some concessions. Certainly at the price it is hard to complain too vociferously, and that a company is attempting to challenge the Adobe monopoly is incredibly encouraging. However, Adobe’s refinement shows and this is where Affinity needs to concentrate its efforts. « How much landscape Photoshop is still a fair game? 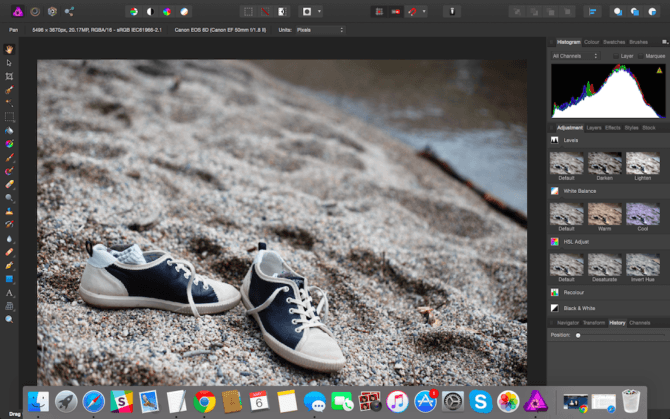 I ditched Lightroom for Capture One Pro and Photoshop for Affinity Photo. Never looked back. I am rather attached to Iridient Developer, which deals nicely with all the usual development stuff, and then I catalogue in a variety of ways… Sometimes I use Photos, especially if I want to do spot repairs, as this does not seem to be available with Iridient. I also use Photos for later use as a screenshow. If I just want to catalogue it, I just use Finder and PreView. Try JAlbum – I switched to it after Lightroom and Windows 10 failed to cooperate on my PC. It is fast and intuitive. I am also looking at getting out of the LR PS grip. Yes I agree. I’ve been using ACDSEE since around 2000. It loads my catalogs up within a few seconds whereas Lightroom seems to take forever. I quite recently migrated to Capture One Pro. Takes a little time to adjust, but I’m very happy. Does not do layers. Also does not have as many controls. AP is a fabulous application, however it’s targeted as a Photoshop alternative, not Lightroom. For an alternative to Lightroom, consider Capture One Pro. It’s taken me a while to get really comfortable with C1, but it’s worth the effort. I migrated quite a while back from Adobe’s software to other tools. Affinity is definitely worth it, I find it to be a really powerful editing tool. For batch processing and photo management I also use BatchPhoto. The fact that you stated right off the bat that you’re coming from a Lightroom background and not much of a Photoshop user said it all right from the beginning. 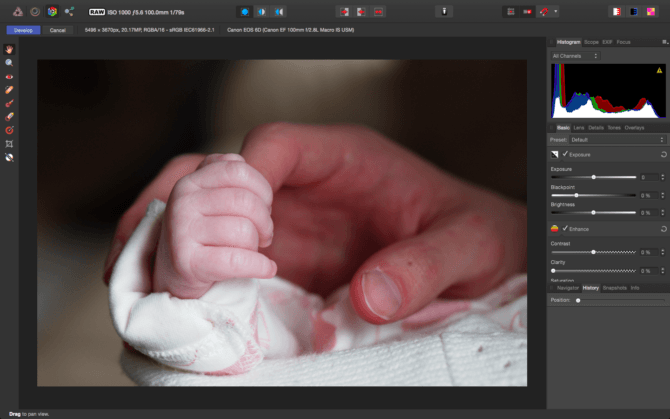 Have you seen the 32bit capabilities of Affinity and compared that to Photoshop’s ? Affinity is also a LOT faster than PS in usage and has a ton of features which PS should have but has been the same old, same old for too many years. The fact that Affinity is priced at just £35 with no subscription model in sight makes it a complete and utter no brainer. Lightroom on the other hand is a very light photo-editing software but a great batch editor and I’d have thought brilliant for Wedding photographer types who need to apply batch automated adjustments to hundreds of photos at a time. Lightroom is also an awesome asset management cataloguing tool. “CAN IT GIVE ADOBE A RUN FOR ITS MONEY” On my PC [a three year old HP Envy with AMD 8-core, RAM maxed out, & SSD] Affinity will have run much faster to compete with Adobe. 1-Opening a new raw [RAF] file takes significantly longer than either LR or PS. 2-The response when moving the basic adjustment sliders is slow enough to cause a lag that makes use tricky, something that is not a problem with the same image in LR or PS. 3-HDR merge causes a freeze then a crash using three images that cause no issues in LR although LR is leisurely. I did not continue with Affinity after this brief experience except to explore some of the basic adjustments and their menus. In terms of actual effect on the images,it appeared that the basics are comparable to LR and ACR and some might even be superior. However, for me there was no point in pursuing this matter until stability and speed issues are resolved. Maybe after the next major update. Admittedly I’ve never used Photoshop, but Affinity Photo is very good. I also use Lightroom, but I find myself in Affinity 99% of the time. I also have Capture One Pro and it’s decent but lacks many of the features that AP has. It will be years before I grow out of AP. If you want a decent program for cataloging, use ACDSEE. I use it and it is much faster than Lightroom. I can do everything I want in it. No subscription charges just a one off payment. Oh and I love Affinity Photo. Just waiting for them to bring out affinity Publisher next so I can ditch Indesign. I currently use Faststone – and looking for a non subscription proper software. I am not a professional so i’m not paying C1 Price, but will consider anything upto £80 ish. I’m currently looking between Cyberlink – Photo Director 8. ON1 Photo Raw 2018 & Affinity. I only really want the 1 software. so don’t want to be using one then jumping to another. Which of the above or A.N.Other would you recommend. Thanks in advance.